How many times have you looked at ramp models with awe, amazed at their poise, good looks and suave movement? Chances are that if you observed them too closely you ended up seeing very less. “Look closely, because the closer you think you are, the less you’ll actually see“, says Morgan Freeman’s character of Thaddeus Bradley in the 2013 American thriller Now You See Me. Perhaps it missed your attention but one of the reasons why models, successful celebrities and professional speakers look inspiring is because they always ‘stand tall‘. We are not referring to the fact that maybe these people are wearing shoes with heels or some kind of aid to boost their height when they make such appearances. Instead we mean to indicate that such people have perfected the art of good posture and are able to use it to their benefit to appear taller, thinner and more confident. If you ever wondered why women wear heels despite knowing about their discomfort, its because that kind of footwear automatically forces them ‘stand tall’. “Sit up straight!” “Don’t slouch!“, admonishing words that many of us have heard from our mother’s during our childhood. If you were smart enough to not have ignored them you probably realize it today in your adulthood that mother always knows best because good posture is important. Its important because 1) it directly affects your health and fitness, 2) it sends a message about how you feel about yourself, and 3) good posture can make you appear taller, thinner and more at ease. So what exactly is good posture, let us try to understand this a little more. Think of your body as a building, an architectural marvel designed to work with the force of gravity such that no one structure is over-stressed. In the physical world, an architect has to take these same laws of gravity and weight distribution into account when he or she designs a building. And like a building with a poor foundation a body with poor posture is less resistant to the strains and stresses we experience over the months, years and decades of life. Defining the perfect posture in non-medical terms is a tough task. The closest possible match to define the ideal posture is to illustrate the neutral spine. Also known as the neutral posture, it is defined by Webster’s New World Medical Dictionary as the stance that is attained “when the joints are not bent and the spine is aligned and not twisted“. The body spends the least amount of energy to maintain this position as it puts the least amount of stress on the body’s tissues. Imagining the body to be in this posture, however, depends on whether the person is standing or sitting. To test whether one is standing in the ideal posture, check to see if you can draw an imaginary straight line that connects your ears to your shoulders, all the way down to your ankles. While sitting, your back should be positioned in the familiar S-shaped spinal curve. But then its the sitting that actually wrecks our posture in the first place, particularly for those who spend most of their time sitting on desks or driving. As we focus on the activity in front of us we tend to protrude the head and neck forward. Because the body follows the head, the lumbar spine tends to round forward as well. When this occurs, the weight of the head and upper body is no longer balanced over the spinal column but instead must be supported by increased muscular energy and placing spinal ligaments on the stretch. Over time this leads to fatigue and eventually even pain in the neck and upper back. Organizations that rely heavily on their employees to spend long hours on desks are gradually learning about the harmful effects of poor sitting posture. As a result, most reputed firms now furnish the office with ergonomic chairs and desks. Some even goto the extent of training the employees on how to maintain good posture, having office yoga breaks or yoga classes during office hours. Increased awareness about these things certainly helps as maintaining good posture is all about being aware of your physical state. If you are someone who wants to prevent the long term side effects of slogging it out at the office, then have a look at some simple office yoga moves that you can do to ‘stand tall’ at all times. Sit with feet hips width apart and fold your upper body down over your legs. Do not pull your self down! Just let gravity and your breath do all the work. If your body does not fold down far enough to rest comfortably, then place your hands on your desk and rest your forehead onto your hands. it fall back. Roll your shoulders open and breathe across your chest. Hold for a few breaths and relax. Sit sideways in your chair. Engage your core (stomach muscles) to lift your upper body up and twist to the side. Let the head turn to look over the back shoulder and also move the eyes to look to the back corner of the eye socket. Breathe and repeat with the other side. Sit with feet hips width apart. Hold on to the side of the chair while leaning away. Let your body weight rest in the arm holding the chair and let your head fall to the side. Breathe into the shoulder and neck. Repeat with the other side. Are you someone who has a desk job and has developed complications of neck pain, back pain, carpal tunnel syndrome etc? Have you checked your posture lately? 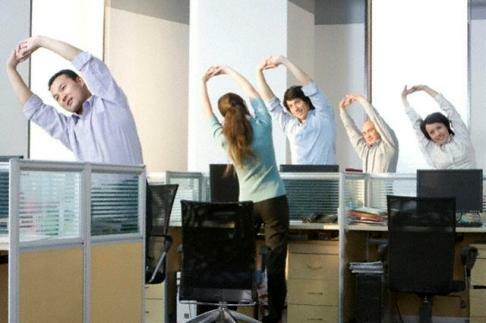 Try out these office yoga moves and let us know if they prove to be helpful. Note: The author Khira Malit, has been practicing the life style of yoga for over 14 years. Her teaching method is a hybrid of the various styles she has practiced and trained in. Khira has trained with acclaimed teachers Shiva Rea, Sean Corn and Ashley Turner and is certified to teach hatha, vinyasa, restorative and yogic arts. Khira uses her training of acting to entertain while teaching retreats and helps others break through their own inhibitions. She currently teaches at the Spa Resort in Chiang Mai, Thailand.